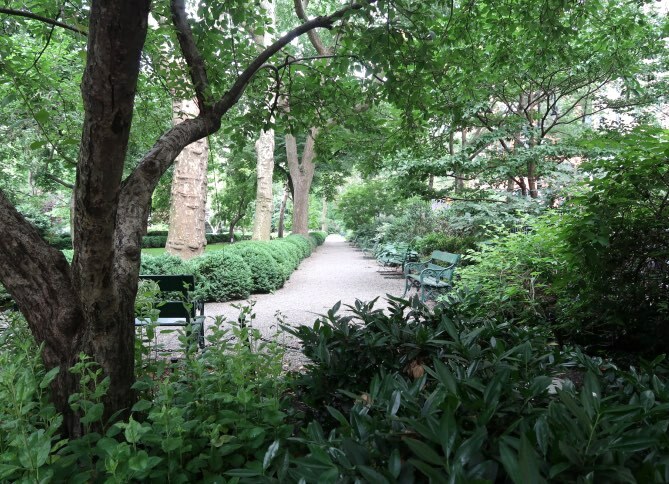 By sheer coincidence, I was tweeting about Gramercy Park, a private park in NYC, and then Gothamist posted this very enlightening and well researched piece about Gramercy Park. Now the Mayor is talking about revisiting this whole idea of a gated park for the affluent residents of that neighborhood alone! What I tweeted about was the fact that I’ve been passing by this beautiful park for decades now, and it’s almost always completely empty. It’s such a waste, and just seems wrong that it can be locked up and unused like this. I wonder what the rationale is for making it private? It does seem like a waste to not be open for public use. However, the birds and the bees probably enjoy having it to themselves. And it’s good for the air we breathe….. Keeps landscapers in business ….. So I guess I would love walking by it and seeing its peacefulness. It beats seeing concrete and a 7-Eleven there. Yay! and Wah-Hoo! I loved reading about Damnation Island in Sunday’s NYT Book Review! Rebecca, now you’ve got me worrying about the birds and the bees, and what they might lose if we open it up! Living in Minnesota with its 10,000 lakes, 78 state parks and recreation areas, as well as many protected forests and preserves, it is difficult for me to imagine how rare and precious natural park-lands in the New York City area are. One would think that these publicly-owned park-lands would be open to all and well taken care of. Most are! This is an exception and I think it’s wrong.